Another regular reviewer is back tonight - the college bum, Sean! He's all about the vintage Star Wars - tell us all about it, CB! 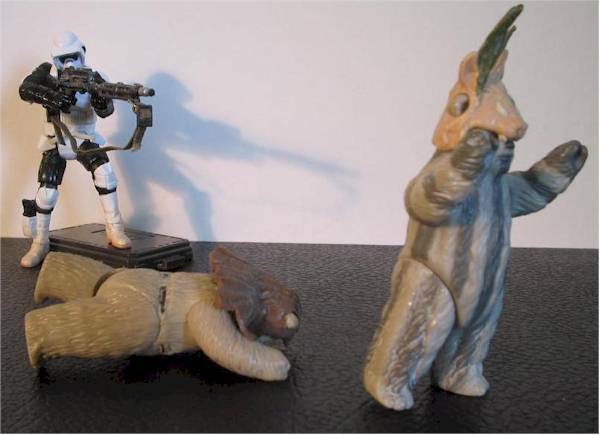 Joy, I found some Star Wars figures to add to my collection. 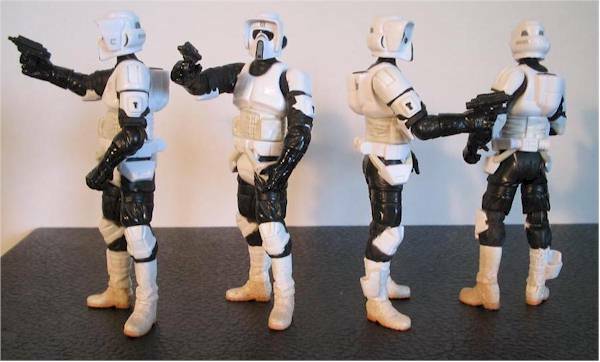 With the release of the new Vintage-style figures, Hasbro’s finally given us something we’ve been waiting for for years: a decent Scout Trooper. The rest of the wave is filled by a new Greedo, an Endor Han Solo, a Tusken Raider, and a new Pilot Luke. There are some figures I would have preferred to see in this wave over Han or Greedo, but Hasbro’s planning on releasing more vintage-styled figures in the future, so we’ll wait and see what comes out of the grinder over the next year or so. Like the previous vintage-styled releases, these cards use the same layout from the original figures of the late ‘70’s & early ‘80’s. The back shows the original carded figure as well as the other ones available in this wave. The card itself is sealed in a protective case. Apparently the first ones were released with the clamshell case taped closed like the previous vintage figures; however all the releases since then are heat sealed. Not exactly collector friendly, but excellent for the MOCer’s out there. Compared to the previously released twelve vintage-style figures, I feel these five are much stronger across the board when it comes to their looks. Now I know which figure most of you will be gunning for out of this batch, and I’m happy to say he’s the best-looking of the wave. The Biker Scout is a huge improvement over the ridiculous-looking versions we’ve previously seen. The armor is pretty movie-accurate from his helmet, to the little straps hanging over his thighs. His hand sculpts are pretty nice and work well for holding weapons or gripping the handlebars on his bike. Best of all he can actually hold his rinky-dink pistol with no problems. The only issue here is that his head seems a tad small, but it’s not that far off scale-wise. It’s hard to judge accuracy with Luke’s pilot outfit since there appears to be a few changes in the costume when you watch the movies. This is based off of the version seen in A New Hope. It appears to be relatively accurate although the chest tubing and cartridge ring on his boot appear on opposite sides sometimes in the film and press photography. Nit-picking aside this is the best sculpt of the Rebel pilot outfit yet. The gloved hands look great either holding a weapon or poised over the console of an X-Wing. The separately sculpted leg straps add a nice touch that’s been missing with previous versions of this figure. Basically the only problems with this figure are from the neck up. The neck itself is thin and kind of flat, which looks really weird. Hasbro has a heck of a time sculpting Mark Hamill. Instead of having another go at it, they took the same head from the previous vintage-style figure and basically did a repaint. It kind of looks like Hamill, but could have been better. The huge empty spot under the back of his hairline looks a bit weird and just points out his flat neck even more. He looks better with the helmet on. Greedo appears to basically be a retooled figure. The body and head sculpt look very similar to the Comm-Tech figure with new hands and articulation. He looks pretty good but looses some points for the kit-bash factor. The gun belt is basically a retooled Han Solo belt, and looks slightly out of place. The Tusken Raider’s robes are pretty accurate, but not overly exciting. The head sculpt is nicely done as is the detailing on his bandoliers. The one problem with sculpting a figure that’s primarily wearing nothing but shapeless robes is that the finished product isn’t going to stand out. The cloth robes are a nice touch with this figure, but Hasbro should have made removable bandoliers to wear on the outside of the figure’s clothes. 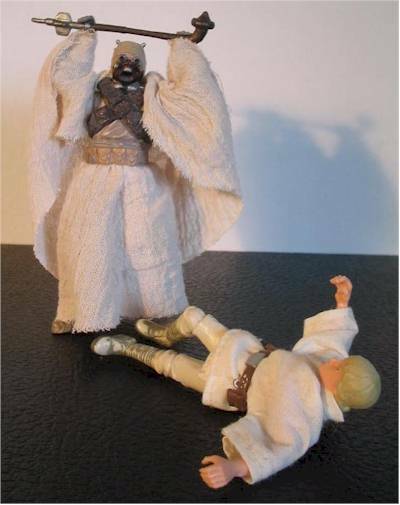 If the Tusken’s jacket is closed, all you can see is his head and hands. As for Han, this really isn’t a bad sculpting of the character but there are so many little things wrong with him that eat away at the final grade. There are some wonky proportion problems here. Han’s torso throws off the rest off his body. It’s too big –almost like Han has a bit of a beer gut that wraps around from front to back. 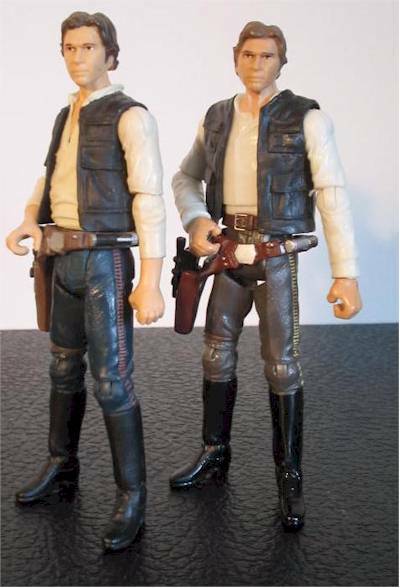 When combined with the knobby ball-joints of his shoulders, Han’s head looks too small. Add on his vest and trench coat; it gets even worse. His legs and waist seem very spindly because of this; despite being the same exact sculpt from the previous version. The head sculpt itself it the same one from the previous vintage-styled Han as well, only a bit smaller. While it’s a decent likeness of Harrison Ford, Han had a slightly different look in Return of the Jedi. This version needs a few years of age and a different hairstyle. I do have to say Hasbro did a pretty decent job on the paint. Each figure is pretty clean and there are only a few issues. 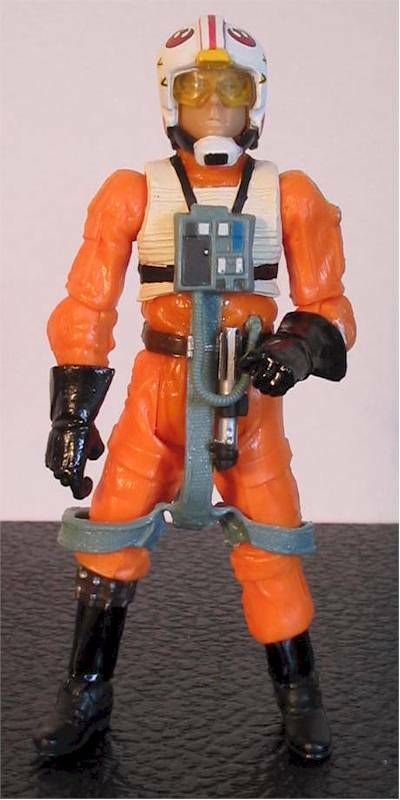 For Luke, his eyes are a tad off and the white on his jumpsuit is kind of thin –you can see orange through it. His neck has orange seams up the side as well. The yellow striping on Greedo’s suit is also a bit thin in areas. Plus I seem to remember his eyes being deep crystal blue. The biker scout is pretty clean, in every sense of the word. He’s got a little dirt wash to his boots but the rest of his armor looks brand-spanking new. The Tusken Raider has a nice wash to him, but how exciting can different shades of dirt really look? The stripes on Han’s pant legs are a bit hit and miss but not bad. One thing Hasbro does better this time around is the consistency in articulation among these figures. Each figure has fourteen points of articulation. Luke, Han, & the Scout have ball-jointed heads, shoulders, elbows, knees, ankles, limited ball-jointed torsos, and cuts at the hips and wrists. Greedo has the same except for his cut waist joint. The Tusken Raiser has a cut waist joint, and angled elbow cuts. Ball-joints are becoming more and more common among Hasbro’s Star Wars figures and I’m glad to see it. Luke and Han can pretty much hold whatever pose you want them to. Greedo’s pretty articulated for a guy who’s entire role consists of getting shot and slumping over. 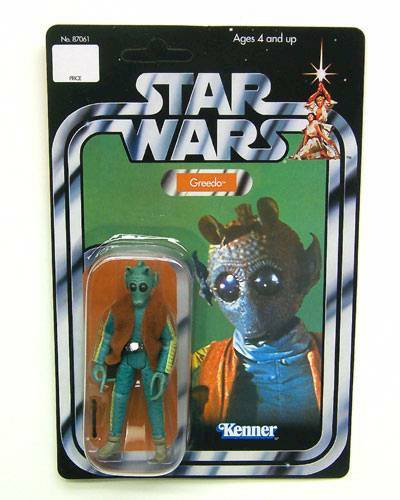 The joke here is that the one joint Greedo needs to do that action isn’t present in this figure. I have no idea why Hasbro chose cut elbow joints for the Tusken Raider since they make it hard to pose him with his rifle in a firing position. Maybe they thought the cut joints would look better with the sculpted robes. Since his jacket covers the joints anyway it shouldn’t really matter. I saved the Biker Scout for last on purpose. Even though he’s got great poseability there’s something extra Hasbro could have done for him. In their ROTS line they gave ball-jointed hips to a relatively useless figure (AT-TE Gunner) and kept them off of all other figures. If any character could use the extra flexibility in his legs, it’s the Biker Scout –by virtue of his chosen vehicle. 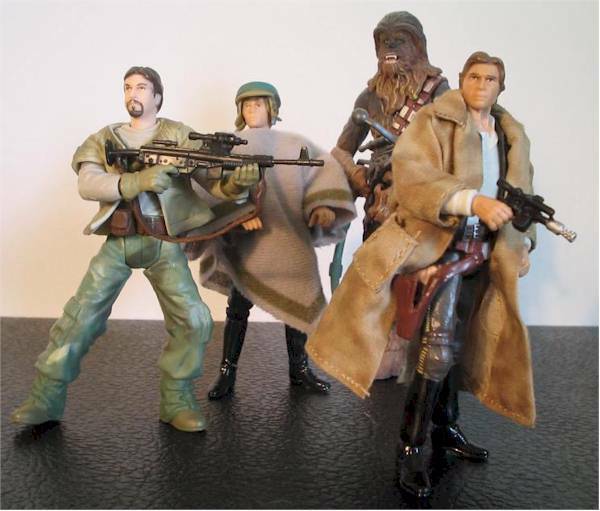 I feel this is a poor oversight by Hasbro –especially since they gave some to Luke in the first VOTC wave. Just like the previous releases these figures are inconsistent with their accessories. At least we don’t get the same Imperial Blaster packed in with multiple figures like last time. However I do have to welcome all of you to “The Land of The Repacks” . 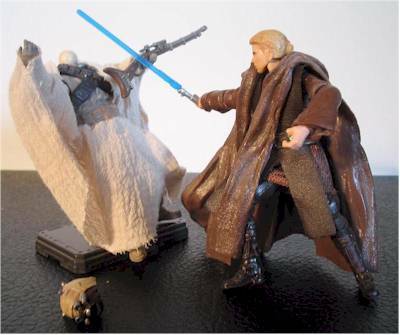 . .
On the strong end, we have Luke and the Tusken Raider. Luke comes with his helmet, pistol, ignited lightsaber, and lightsaber hilt. His chest box is also removable if you really want to count it. The helmet is painted soft clear-yellow plastic and looks great. I’m a little worried about the chin strap breaking off in the future, as it is a tight fit on Luke’s head. Of course we’ve seen this helmet before, painted a few different ways. We’ve also seen the pistol, saber, and hilt as well. The reuse keeps Luke from a perfect rating, but there are other small issues as well. First off, he has no holster for his pistol. I suppose you could stick the barrel in his leg strap, but it’s no the same. Probably more noticeable is that for some reason Luke has Vader’s hilt. I know Hasbro probably had a surplus of these things lying around after producing all those Darth’s during Revenge of the Sith, but come on. For a figure that costs almost double a regular release, we can’t get the correct two cent piece of plastic? 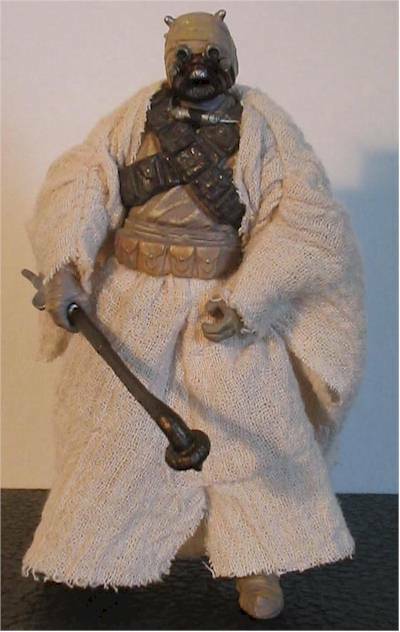 The Tusken Raider comes with a removable jacket, his rifle, and a gaffi stick. Even though both weapons are reuses I have to say that I really like the paint ops –especially on the rifle. The silver detailing is sharp and looks really nice. The jacket seems a bit strange since the bandoliers that should be strapped over it are sculpted to the Tusken’s chest. At least the fabric is thin and looks decent. Greedo comes with his gun and a vest. Well I wouldn’t really say “his” gun. Despite having the one new weapon in this wave, this pistol is probably less movie accurate than the one used with the Comm-Tech figure. It looks alright but the design seems to invoke more of a Star Trek feeling than Star Wars. The fuzzy vest might not appeal to collectors either. Frankly you might just want to repaint the Comm-Tech figure’s vest and use that. 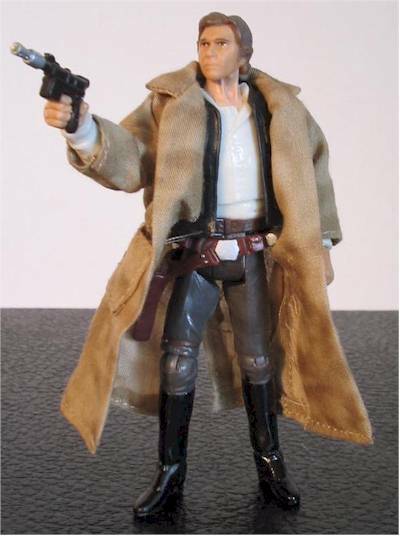 Han comes with his repainted blaster and camo trenchcoat. The coat is actually a pretty good accessory, complete with two outer pockets that his blaster or some thermal detonators might fit in. Not that he comes with a couple of detonators . . . The camo on the coat makes it look more like the outside has a series of dirt stains as opposed to various brown patterns. The inside of the coat is kind of a mess with loose threads and rough edges everywhere. His plastic vest is also removable for all you customizers out there. Finally we come to the Biker Scout. He has his pistol. That’s it. We’ve seen it before. I was really hoping that Hasbro would appeal to the many fans of the Battlefront games and toss in a sniper rifle for fun. Of course some people might say that the Scout never used a rifle in the original trilogy. So what? Neither did the Tusken Raider –only in the prequels. One thing that each figure comes with is a little silver sticker Proof of Purchase. If you collect all five of these and attach them to the card included with the X-Wing Luke, you can send away for an exclusive George Lucas figure in Stormtrooper armor. It’s kind of a nice return to those mail-away offers from the original figures and fits in with the theme quite well. For the most part these figures feel pretty solid. The joints in Han’s legs feel a bit loose, and the hands on the Scout pop off a bit too easily, but they’re not so bad. With no Star Wars movies to help sell them, figure prices have been a bit high. The least you’ll probably end up paying in stores for basic figures is six bucks. Online, Amazon’s been charging $8.99 plus shipping, which is nuts. The cheapest you’re going to find these figures is for $9.99 at Toys ‘R Us. Target is asking $11.99. I know we’re paying extra for the packaging, but I feel ever since Hasbro upped their game with the improved sculpting, accessories, and articulation found in the ROTS line, that the novelty of these style figures has worn off a bit. $10 plus seems a tad too much. You’ll have no problem finding Han or Greedo. The Tusken Raider doesn’t take much looking for either. As for Luke and the Biker Scout, they may prove to be a bit harder to find. For some reason this wave seems a bit underwhelming when compared to the previous releases. Perhaps it’s the figure choice this time around. 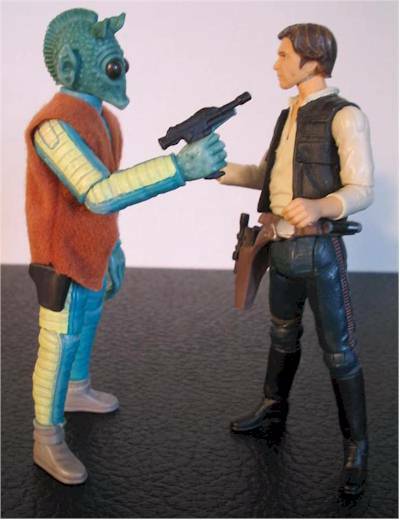 Greedo is basically the same figure found in the Comm-Tech and Saga Cantina waves, but with better articulation. 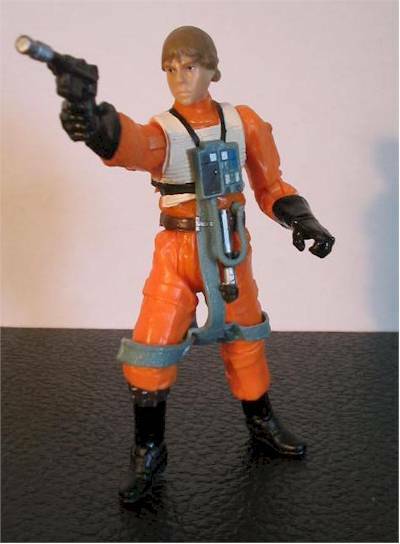 Han is a retooled version of the superior previous vintage-styled figure, and there are a few other versions of Luke I’d rather see than the pilot one. That being said, in many ways Luke is actually the best figure in this wave. Despite the reused accessories and head sculpt, the pilot outfit looks great. This is an excellent figure for customizers out there. Replace Luke’s head with any other and you got an excellent troop builder body here. The Tusken Raider is kind of a mixed bag. True there has never been a version with this amount of articulation or soft goods, but we’ve had a series of decent looking Sandpeople within the past few years. While I feel this version is certainly the best one out there, he’s not perfect. 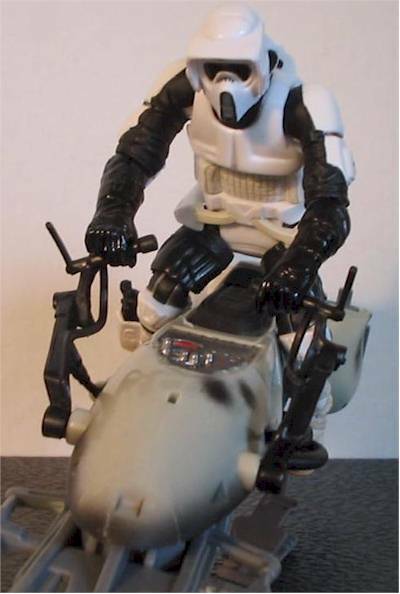 The Biker Scout is a figure we’ve all been waiting for. The goofy statue-like versions of the past were never great for troop building. Especially with his renewed popularity in the Battlefront games (C’mon, who doesn’t love sniping Ewoks?) this guy was long overdue. Of course, you’re going to have to supply your own sniper rifle. And bike. For those fans of the prequels, you can also turn this guy into a Kashyyyk clone trooper with a custom camo paint job. When all is said and done these are easily some of Hasbro’s top of the line releases, but with better sculpting and articulation more common among their basic figures, they’re not quite as effective as the previously released twelve figures. Also, there are a few other figures I would have preferred to see in this wave. Greedo and Han could have been waitlisted to a future release in favor of others such as a new Walrusman, or Death Star (Squad) Commander. I could always go for a decent-looking Leia as well. I know Hasbro did a nice Jedi Luke for the Saga collection, but I’d love to see one complete with ball-jointed articulation. We’re going to get a basic Endor version down the line, so here’s to hoping. 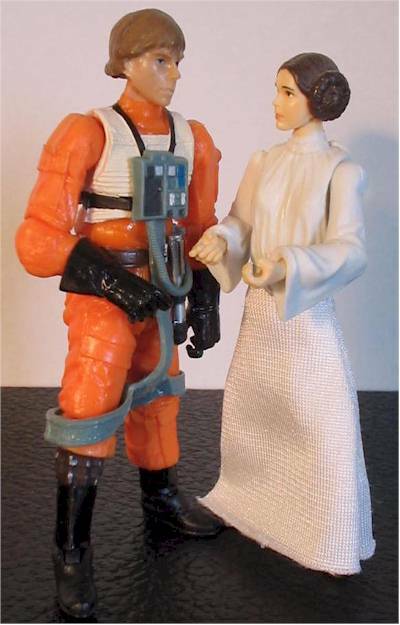 Now I don’t know this for a fact, but from what I’ve heard we’re going to get a few more vintage-style figures later this year, including: Jawa (with light up eyes), a Bespin Luke, an Endor General Leia, an ESB Vader, and a Snowtrooper. While I’m looking forward to the Leia and Snowtrooper figures, I’m kind of scratching my head on the other three –if the list is accurate. Sure we could use a good Jawa for those Tatooine dioramas, but another Vader? Between the VOTC, 500th figure, and Evolutions versions out there, I don’t really see what else we can really do here, especially since Hasbro’s going to keep repacking various versions under different names. I’m sure a new Bespin Luke would look great, but the Saga version released a few years back is still a pretty good figure, even with cut joints. I just don’t want to see a bunch of reused sculpts and kit-bashing.